Surely I can’t be the only one who craves good old fashioned vanilla pudding from time to time! I’ve created a creamy vegan almond milk pudding, flavored with real vanilla. This is a proper pudding that sets and develops a skin. It’s perfectly suited for festive holiday garnishes or a dollop of whipped coconut cream. Many classic pudding recipes already include cornstarch as a thickener, but also use egg to bind the mixture and add richness. In my trials I found that adding a little bit of tapioca starch and coconut oil did just fine for replacing the egg. I thought about whipping out the aquafaba for this recipe but honestly it’s just not necessary. 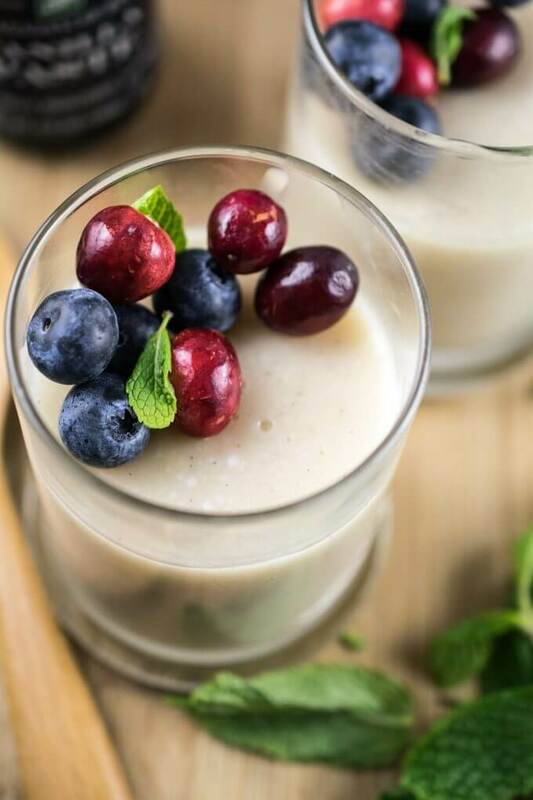 This vegan vanilla pudding is already thick and creamy and sets up great to be enjoyed as-is or incorporated into other desserts. (For example, a version of this same custard is used in my pumpkin bread pudding). Of course, swapping in almond milk for the dairy milk was an easy substitution to make. I purchased my almond milk, as well as all of the other ingredients for this pudding, at The Fresh Market. The Fresh Market is a gourmet supermarket chain with stores all across the USA. I headed to the northern Baltimore location this weekend and bought The Fresh Market private label almond milk, coconut oil, maple syrup, and vanilla paste. 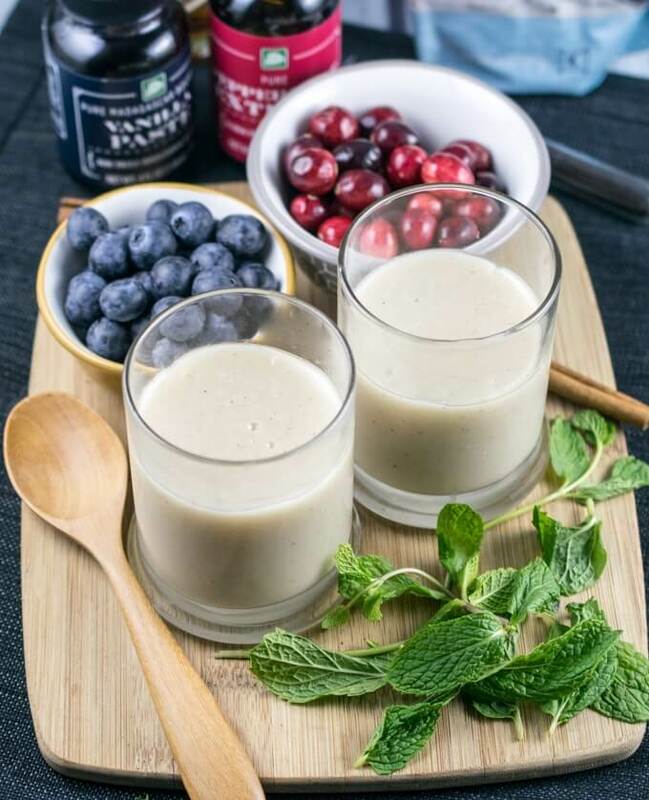 The latter is the star ingredient in this vegan vanilla pudding, giving it a robust bourbon vanilla flavor and beautiful flecks of vanilla bean throughout. All of these ingredients, in addition to using them in the almond milk pudding, are staples that I use throughout the holiday baking season. You can learn more about The Fresh Market’s holiday offerings in their Christmas brochure. I was particularly excited to make my vegan almond milk pudding using The Fresh Market maple syrup. There are actually some quite tasty vegan pudding cup brands available at stores in my area these days. But all of them are sweetened with cane sugar. I’m happy to report that my experiment with using a less refined sweetener, maple syrup, was a total success! The texture, flavor, and sweetness are all perfect. If you have a The Fresh Market location in your area, check it out! It’s a great place to shop around the holidays. The inside of the store is warm and inviting and I found myself enjoyable browsing the holiday gift offerings and semi-prepared options. Some of the other vegan offerings include freshly-prepared zucchini and butternut squash noodles; pre-chopped mirepoix; a variety of vegan snacks, sweets and soups; and a selection of fresh produce. There’s also an excellent bulk snack section. You can check The Fresh Market’s store locator for stores near you. I hope you enjoy this easy, 6-ingredient vegan almond milk pudding flavored with real vanilla paste! If you give it a try, let me know! Old-fashioned thick and creamy vanilla pudding, made vegan with almond milk. With only 6 ingredients and a few minutes of active time, this almond milk pudding comes together in a snap; just be sure to allow time for the pudding to set. Measure 1/2 cup of the almond milk into a small bowl and whisk in the cornstarch and tapioca starch until there are no lumps. Meanwhile, in a saucepan heat the remaining almond milk and the maple syrup over medium-low heat. As soon as you see bubbles on the surface, add the cornstarch mixture and stir in well. Continue to cook the pudding, stirring occasionally, until mixture is beginning to thicken and reaches a gentle boil/steady simmer, 4-6 minutes. Reduce the heat slightly. Continue to cook the pudding, stirring occasionally, for another 4 to 6 minutes until thick. You can test this by dipping in a spoon and checking that the pudding falls off of the spoon slowly. Turn off the heat and stir in the coconut oil and vanilla bean paste. (It may take a few seconds of stirring for the coconut oil to melt completely). Divide the pudding into 4 to 6 jars or ramekins. If you want to prevent pudding skin, press a piece of plastic wrap into the surface. Otherwise, loosely cover the dishes. Transfer to the refrigerator and let cool completely before eating, about 3 hours. GRAIN-FREE OPTION: You can try making this pudding without cornstarch by substituting additional tapioca starch for all of it. I do not prefer the texture this way; it gets a little "gloopier" and doesn't set quite as well, but it definitely does work if you need your almond milk pudding to be grain-free! ALMOND MILK: This pudding works best with commercial almond milks, rather than homemade. This is because store-bought almond milk is usually pasteurized and has added ingredients to help thicken and emulsify it. These same qualities will help your homemade almond milk pudding set better. If you want to use homemade almond milk I recommend adding a pinch of xanthan gum to reduce your risk of watery pudding. 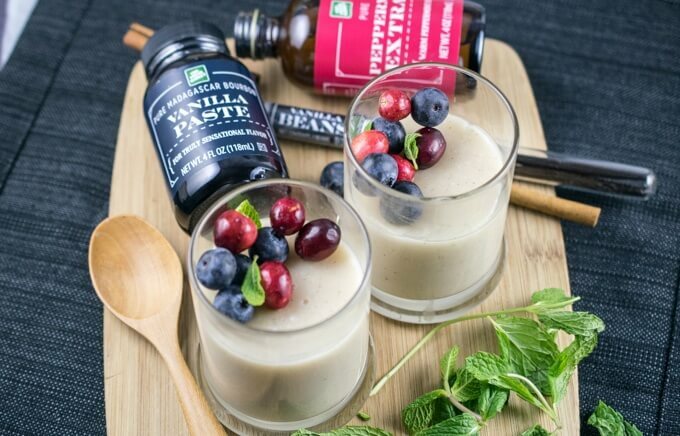 VANILLA PASTE: If you aren't able to purchase The Fresh Market vanilla paste or another vanilla paste, you can substitute vanilla extract with a 1:1 substitution. TAPIOCA STARCH: A combination provides the best texture, but if needed, you can use additional cornstarch instead of the tapioca starch. Adapted from Hell Yeah It’s Vegan. 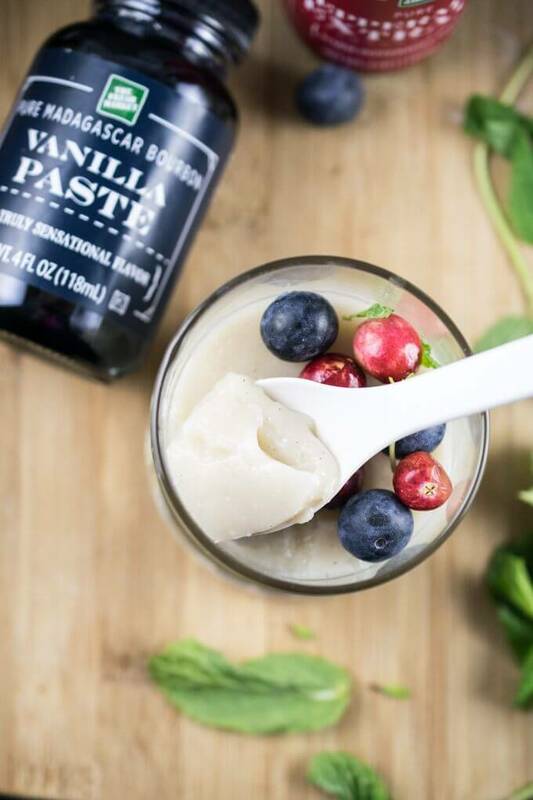 Do you have a recipe for making our own vanilla bean paste? None of my local stores sell this. Sorry, I haven’t tried making my own yet, but you can substitute vanilla extract and the recipe will still come out well! If I wanted to make chocolote pudding would I still use the maple syrup? Hi Nancy, I haven’t tested a chocolate version of this. I think it would depend on what sort of chocolate you add. If you’re using cocoa powder then you probably still need almost all of the sweetener but if you are using melted, semisweet chocolate then you would want to reduce the maple syrup. However, I’m not sure what the exact quantities would be. Do let me know if you figure it out! Hi there, does this work without coconut oil? I would recommend substituting a pat of vegan butter or some other type of saturated fat if you can… just a little bit helps it taste richer and firm up better in the refrigerator. I think you could probably make it without but it may be a little more watery. Can you make it sugar free and stevia free? For diabetics and allergies? My wife is a real pudding afficionado and she LOVED this recipe! It never made it into 5 jars, we ate it warm straight from the pan! THANKS FOR THIS SHANNON! I’d rate it a 10 if there were that many stars! I’m so glad to hear that! Thanks for sharing your modifications!